I hope that you all are having a wonderful day with your family and loved ones. Sentimental Sundays is having an Anything Goes New Years Blog Hop! Sunday, January 1st brings the start of the "new" Sentimental Sundays challenge blog and they are starting things off with a fun and prize loaded blog hop! To top it off, if you help spread the word about the blog hop you have a chance at winning a $20 Gift Certificate to your favorite online store. 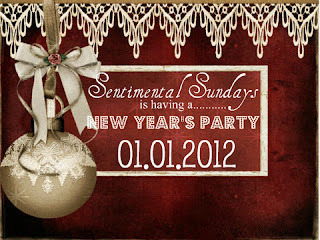 But, you will have to pop on over to Sentimental Sundays to found out all the details. Last week, I accidentally posted some exciting news that I wasn't supposed too (oops!) and I had to remove it. Now, I can officially announce that I am proud to be one of the members of the 2012 Sentimental Sundays Design Team. Congrats on your DT position!!! Congratulations Jennipher on the DT position. You're going to be keeping pretty busy. I congratulate you on your position within the design team of Sentimental Sunday and I wish you a lot of fun and much success. Congrats on joining the Sentimental Sundays team. I can't wait to see what you create! Beautiful card Jennipher. Even tho I have been very lax on blog visiting the past couple of months, I have enjoyed visiting your blog and hope to visit more often in 2012.
and congratulations on making the Sentimental Sundays team.